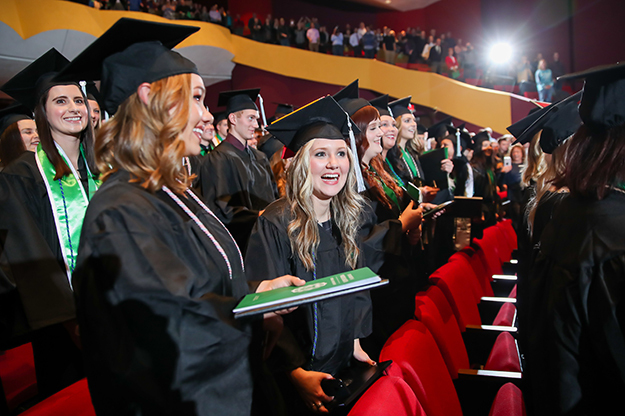 UND saw one of its largest Winter Commencement classes graduate in December, thanks to series of strategic barrier busting moves by the University that have students dancing out the door with degrees in hand. Photo by Shawna Schill/UND Today. Students often dance for joy as they graduate. At winter commencement in December, dignitaries and faculty members on the stage were dancing too. UND has done a lot of graduating, said Scott Correll, UND registrar. “We have a higher percentage of students finishing in four to six years than ever before,” he said. There are a lot of reasons for that, many of them initiatives in the One UND Strategic Plan’s Goal 2, to increase graduation rates. UND has streamlined graduation requirements to industry and accreditation standards, said Correll. Instead of requiring 125 credits for a bachelor’s degree, UND reduced it to 120 credits, which is in line with other schools. That allowed a lot of students to graduate a semester early, saving them money and letting them enter the job force more quickly. The University has removed other roadblocks as well, without compromising degree quality. 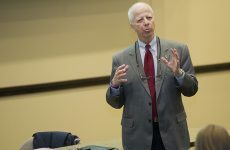 “We’ve made some concerted efforts to help with student success,” said Correll. 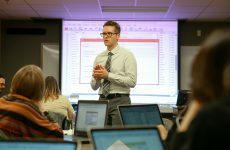 New degree mapping software, developed in conjunction with NDSU, allows students to plan their route to graduation. It extracts graduation requirements from Campus Connection and allows students to plan their courses semester by semester. It lists prerequisites, lets students know if courses will be offered in the fall, spring or every other year, and gives them a printable plan for their four-year degree. It also lets them compare degrees in case they want to look at other majors. It even details typical careers for each major, national and state salary ranges and skill sets. Starfish, a student success system, helps faculty members and advisors connect with students. It sends out early alerts when students aren’t progressing, and “kudos” when they’re excelling. It also helps students and advisors create success plans, ultimately boosting retention and graduation rates. Increasing the number of student academic core advisors also helps students get more individual attention and knowledge of degree requirements. That’s resulted in a big payoff, with 826 degrees awarded in December. It really is a reason to dance for joy, said Fred Wittmann, director of ceremonies & University events, who added a new twist to the commencement ceremony. 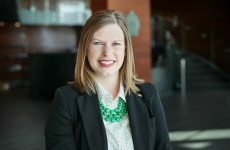 “Graduates wanted their ceremony to be more personal and unique to UND,” Wittmann said. Some students suggested borrowing a UND Hockey tradition of dancing to the song “Chelsea Dagger” by the Fratellis, whenever the Fighting Hawks score a goal at home. After the “Alma Mater,” undergraduates moved their tassels. “Ladies and gentlemen, Your UNIVERSITY OF NORTH DAKOTA GRAD – U – ATES! !” launched the song, with streamer sticks and flutterfetti – and dancing in the aisles and on the stage.